The Jaws of Death: How Spiny Dogfish Destroy Their Prey – Ya Like Dags? One of the paradoxes of public opinion on dogfish is that they’re simultaneously considered a swimming wall of teeth annihilating everything in their path and wussy, poor excuses for sharks. 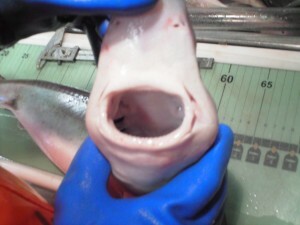 I’ve heard a lot of hearsay about the “weak bite” and “useless raspy teeth” of the spiny dogfish. So this much-maligned species gets the double-whammy of both being a pest and being unworthy of respect as a predator. Unfortunately for those who would rather think of dogfish as totally useless, you can’t have it both ways. In my stomach content analyses I’ve been finding dismembered chunks of menhaden that in life would have been the size of my forearm, which would suggest that the spiny dogfish actually falls pretty solidly on the “respectable predator” end of the spectrum. And lo and behold, science backs this up. First off, let’s get a “last thing a herring ever sees” view of the business end of a spiny dogfish. In fishes it is typically thought that there are three main forms of feeding: ram feeding (in which prey is run down and swallowed whole), suction (in which prey is inhaled), and biting (in which larger prey is chopped up into tiny bits). Most fish use a combination of these, and the structures described above work together to make the spiny dogfish pretty good at all three. In fact, spiny dogfish may make use of all three in the capture and consumption of any given prey item. From Wilga and Motta (1998). Numbers are time in milliseconds. The above image shows the four main stages of feeding identified by Wilga and Motta (1998). Column A is the initial prey capture, which is accomplished with a combination of ram and suction feeding. 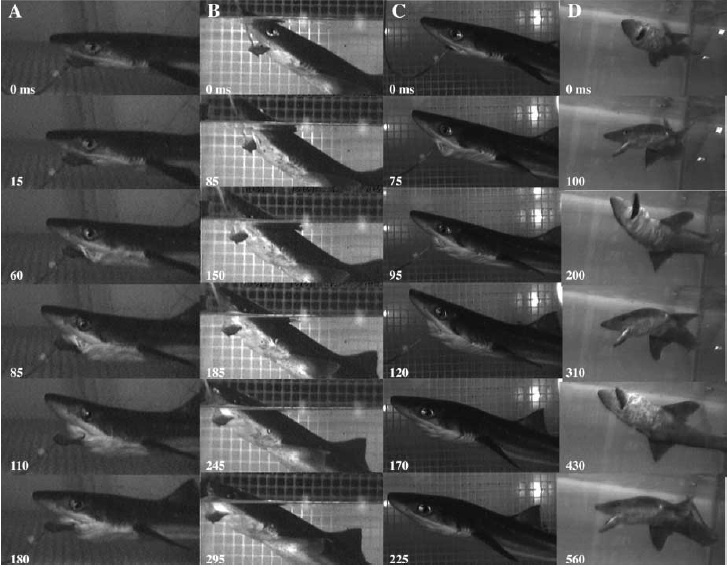 Column B shows manipulation by biting as the dogfish essentially tries to orient the prey for easy swallowing. In column C the dogfish has successfully captured and manipulated its prey and is now swallowing it via suction. Finally column D shows the head shaking behavior typical of many sharks. This behavior drags the prey back and forth across the shark’s teeth and basically saws it apart to allow the consumption of prey that would otherwise be too large to swallow. Whenever the feeding behavior of sharks is discussed, sooner or later (usually sooner) the issue of bite force comes up. Fortunately for this post, Huber and Motta (2004) have that worked out for the spiny dogfish. In the case of bite force, the common conception actually seems to be true: this study found that spiny dogfish bite with a fairly weak force of 20 N. Huber and Motta (2004) included a handy chart that compares the dogfish bite with other bites in the animal kingdom. The 20 N generated by Squalus acanthias is greater than that of a bluehead wrasse (5 N), but below that of a lab rat (50 N), actual dog (550 N), human (680 N), silky shark (889 N), and American alligator (a bone-crushing 13300 N). This is not, however, and indication that the spiny dogfish is a weak predator. 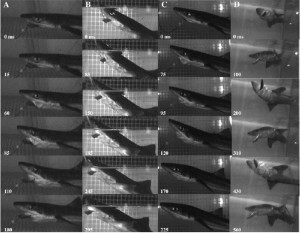 As Wilga and Motta (1998) showed, biting in the dogfish is more for the purpose of capture and manipulation while the actual cutting is accomplished by way of the head shaking behavior. This makes the spiny dogfish well-adapted for a generalist fish-eating diet, and is apparently sufficient to allow these small sharks to attack and consume relatively large fish. So to summarize, the dogfish makes use of all three of the main forms of feeding, and because of this is a consummate generalist piscivore. If they slack off in any department it’s in sheer bite force, but this is mitigated by both sharp teeth and behavior. From a purely biomechanical perspective alone these are pretty impressive predators, so when handling dogfish you should probably keep your damn hands clear of the mouth. cool info chuck, keep it coming! Pingback: Stomach Content Analysis: Halfway! | Ya Like Dags? we catch here in the Northeast. They will wriggle and spin and try their best to get you. If they get hold of your finger, OUCH! !……Only the wolf fish is more difficult to deal with. One of my labmates got barely grazed by one during field work and it was enough to leave a scar. Now she tells everyone she’s a shark attack survivor. Did you make this Chuck? Pingback: AES 2011 Day 3 | Ya Like Dags? I have been exploring for a little for any high-quality articles or blog posts in this sort of area . Exploring in Yahoo I eventually stumbled upon this site. Reading this info So i’m happy to convey that I’ve a very good uncanny feeling I discovered exactly what I needed. I such a lot unquestionably will make certain to don?t omit this web site and give it a look regularly. Thats awesome but little confused and wtf i’m like lolz…………. Pingback: Perfect Little Killing Machines: The Jaws of Death | Ya Like Dags?